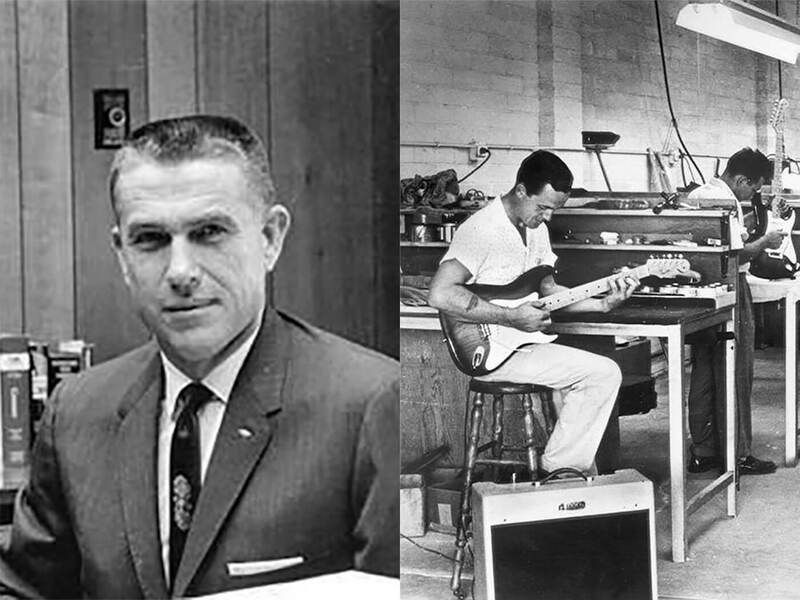 This is the insider’s story of the birth of the Fender Telecaster, the first commercial solidbody electric guitar. The Telecaster was a factory product, stripped down to its essentials, built from easily assembled parts, and made at a relatively affordable price. 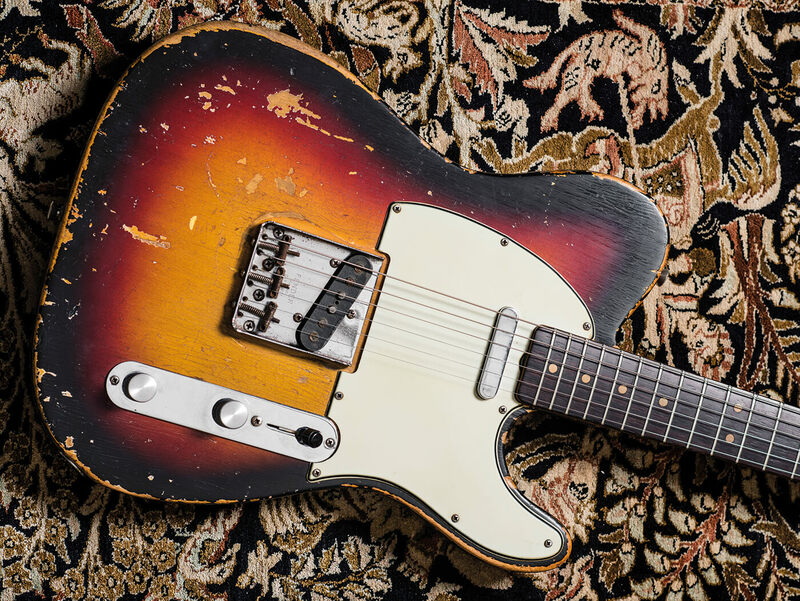 Guitarists of every stripe have come to love the Tele for its elegant simplicity and for its dry bite and twangy punch. Back when it first appeared in the early 50s, it was, quite simply, a revolutionary instrument. This oral history about the birth of the Telecaster comes from interviews I’ve done over the years for my various books about Fender. 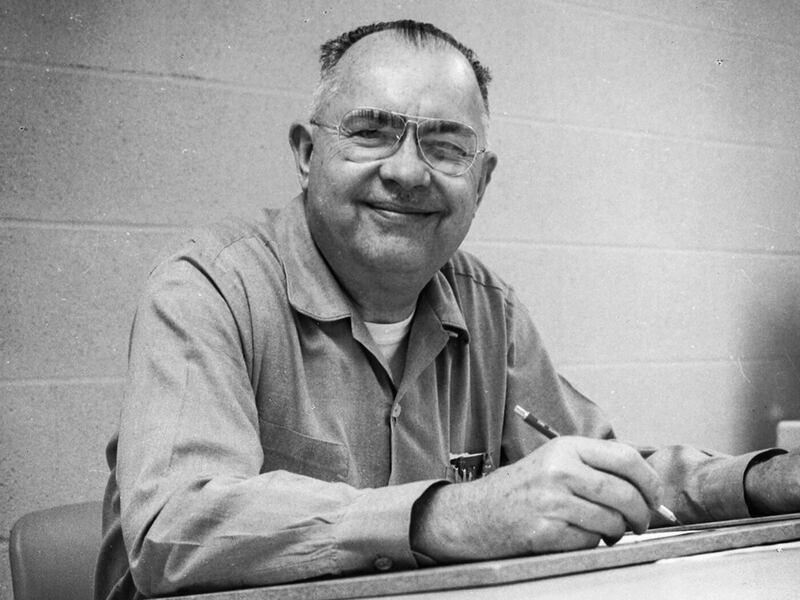 Leo Fender opened his Fender Radio Service store in 1938, and his first guitars were electric lap-steels, made in the mid 40s with his partner, Doc Kauffman, and using the shortlived K&F brand. Doc left, and Leo renamed his new company in 1947 as the Fender Electric Instrument Co, based in Fullerton in Orange County, California, and continuing to produce electric steels and small amplifiers into the 50s. 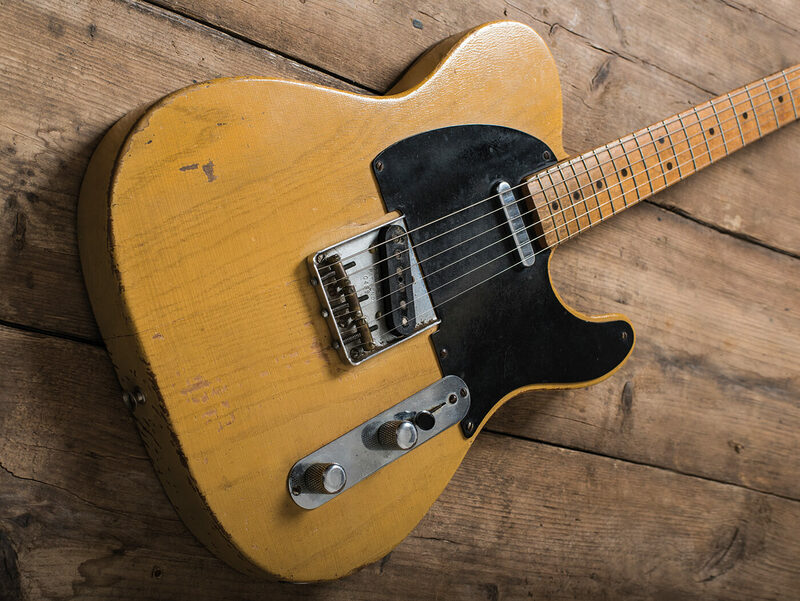 Fender’s new solidbody electric was at first called the Esquire, advertised in 1950 with a single pickup, which morphed into the two-pickup Broadcaster, first offered in about October of the same year. Gretsch objected to the use of the name Broadcaster, and the snipped-decal ‘Nocaster’ was sold from around February to April ’51. 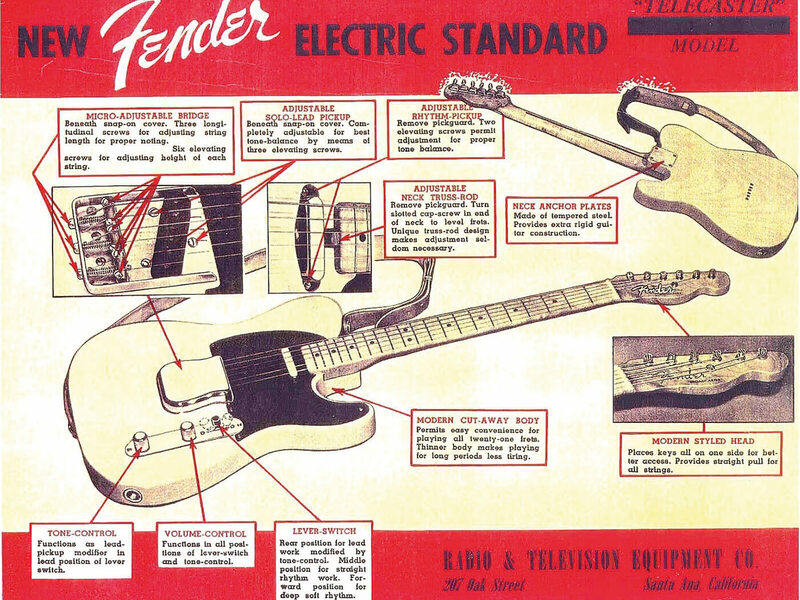 Finally, around April 1951, Fender’s new guitar was given the name that we know best today, the Telecaster. The people you’ll hear from are James Burton, who acquired his first Telecaster in 1953; George Fullerton, who was at Fender from 1948 to 1970; Dale Hyatt, a Fender salesman from 1946 to 1951 and again from 1955 to 1972; and Don Randall, who at first worked for Radio-Tel, Fender’s distributor, from 1946 to 1953, then as Fender’s head of sales from 1953 to 1969.
he set out to do it, he could do a better job. “Although Leo continued research and development, the factory was not always running at full capacity, and there was a three-month period that we were all but closed down. I was the only one working in the daytime, and Mr Fender would come in in the evening, because the bank was looking for him, trying to foreclose. “Leo and I started spending an awful lot of time thinking about this electric guitar. Matter of fact, we did a lot of work toward the design of the body and the neck and different type of things, to something that was workable. Leo and I would be there till two or three o’clock in the morning, because during the day, we had to work to help keep the workshop running. Work on new things and new designs, well… about the only time you had left was at night and weekends, so there were weeks and weeks and weeks when we didn’t take a day off. And most of those days were long, long hours. “Leo was very strong for building something that was very serviceable, durable, easy to repair, and, like he used to call it, ‘built like a tank’, to stand up to rough treatment. We tried to design something that would be strong and do a good job for a playing musician, sound good, be easy to play, easy to repair, all these things. We kind of had our work cut out for us. So we’d set out our design in our own thoughts, but the hard part was accomplishing the entire thing. “The only other instrument that was on the market that had a cutaway [belonged to] Merle Travis, who had a guitar that was built by Paul Bigsby. And of course we knew Paul Bigsby, he was in Downey, about 15 miles from Fullerton. Course, we knew Merle Travis, used to see him play at different places. That Paul Bigsby guitar was a new thing and very different, and of course I’m sure that had a great deal of influence on our thinking, that cutaway. “The first [prototype], we had keys on each side of the neck. But there again, in those days nothing was available, we had to redo and undo all kinds of things. We moved to keys on one side of the head. I know Merle Travis always had the feeling that Leo copied his guitar – his basic idea that he had for Paul Bigsby, that was his idea – but you know, that was notMerle Travis’s idea. That idea goes back to the 1800s, because I’ve seen pictures of old guitars with that head. 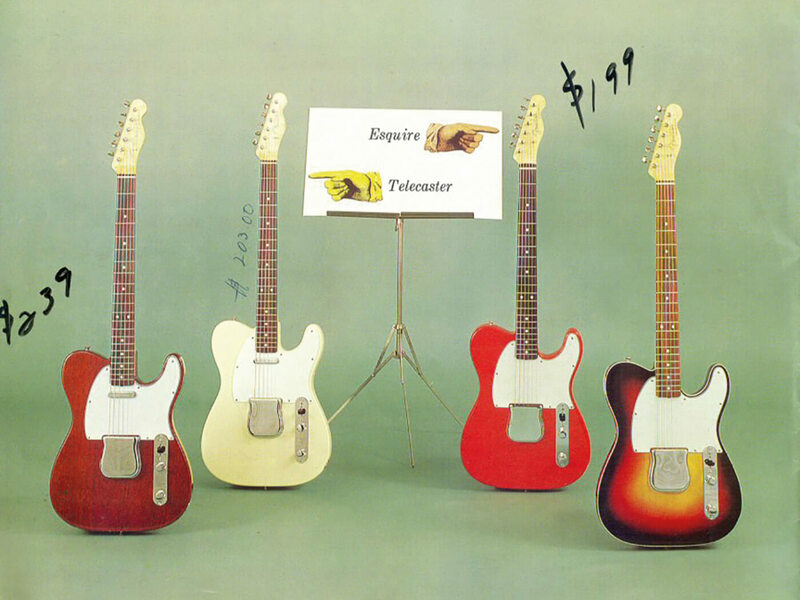 The guitar on the far right of this Fender catalogue shot is featured up close here. 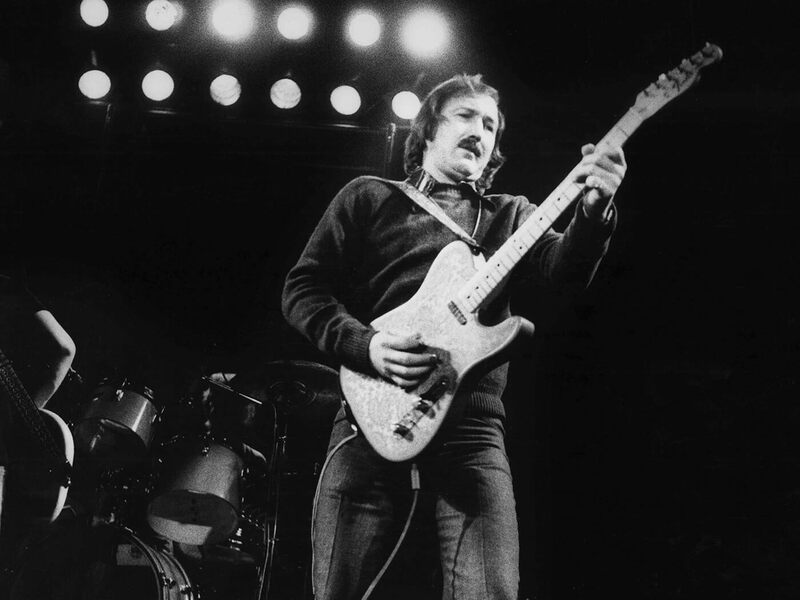 “The original guitar, when we started out, it was only a single pickup, and it was called an Esquire. The first prototypes only had a single pickup, but it really didn’t have a name then, but when it became a production item, it had two pickups and was called Broadcaster. We started with the single pickup, mainly to get the thing designed and working. We were basically interested in those fabulous highs from that bridge, and by [slanting] the pickup, we got better bass on it. And that proved to be the thing that a lot of the country players especially liked. Rock and every kind of music likes it, and still do. “Some bandstand somewhere, if there was some group playing, I was out there with the guitar. Even clear up into the San Francisco area, where my brother lived, little place called Manteca. He said bring it up here, we got an awful lot of country western music here – and they did. Went up there, and it was kinda like going back to Oklahoma. They had these nightclubs going and these guys were playing honky-tonk, country western. I remember the first time going up there, I took five units with me, these were the early one-pickup Esquires. Took ’em up there, I got a guy playing one, he quite liked it, and all of a sudden it just quit. Didn’t know what was wrong with it, and it was embarrassing. “So I went out to the truck and got another one. It lasted about 30 minutes and it quit. Then they started saying: ‘There he goes, ladies and gentlemen, wonder how many he’s got?’ Anyway, the third one kept on going and worked for the rest of the evening. “Leo and I were out one night, some place way over in Los Angeles, and took one of these guitars, one of the first ones. Went to this club over there, the Riverside Rancho, a dancehall [in Glendale]. We went to one side of the stage, and what we wanted to do was wait until the rest time, we wanted the guitar player to look at this guitar. So during this time there was a young fella came in, good-looking young guy, came right over there to where we were and started talking with us. Saw this guitar, he picked it up, looked at it, tried it a little bit. He just kind of backed up and sat on the side of the stage, just picking on this. “So the band’s rest period comes, the guitar player came over that was in the band, and this guy asked the player if he could play right through his amplifier. He says sure, so they moved the amplifier to the side of the stage, plugged that thing in, and there he sat with this guitar, playing it. Well, he got to do a lot of neat things on this guitar, and pretty soon all these people who’d been dancing were crowding around listening to what he was doing. It wasn’t long before the whole band was standing around. He was the centre of attention. And it was Jimmy Bryant, probably one of his biggest steps in getting on. But we didn’t know his name at that time – he told us, but it didn’t make any sense to us. “Jimmy was one of the most fabulous guitar players around. Course, Les Paul was high on the charts, but Les Paul was a different kind of player than Jimmy. Jimmy played things on guitar that nobody could play. And, of course, this was an electric with low action – and with that cutaway, he could go right up the neck. So, naturally, we put one in his hand, and this was like starting a prairie fire. “The ‘Broadcaster’ name came up because in those days, broadcasting was the name of the game, the big thing. But we had to eliminate that because Gretsch was using the name. So we changed to ‘Telecaster’, and that was a natural thing. Leo had his radio-repair shop, and when television was brand new, he probably had the only place in town that had televisions. He had one that he’d put in the window, facing out into the street, speaker outside. At night there’d be a crowd of people round, watching wrestling or whatever was on. Every night, Leo had this set up. He was always interested in people and what people thought and what people did. “The Telecaster is my buddy: we’ve been friends for a long time. I started playing when I was 13. I just happened to be walking down Milam Street in my hometown of Shreveport, Louisiana, and there’s a music store called J&S Music. In the window, they had this beautiful blonde Fender Telecaster, and I stopped and admired that guitar for the longest. I went home and told my mother about it. I was already starting to play a little bit. My dad came home from work, she told him, and he said: ‘Well, take him down there if that’s what he wants and get it for him.’ So we did. I guess that was a new ’52 or ’53 model.